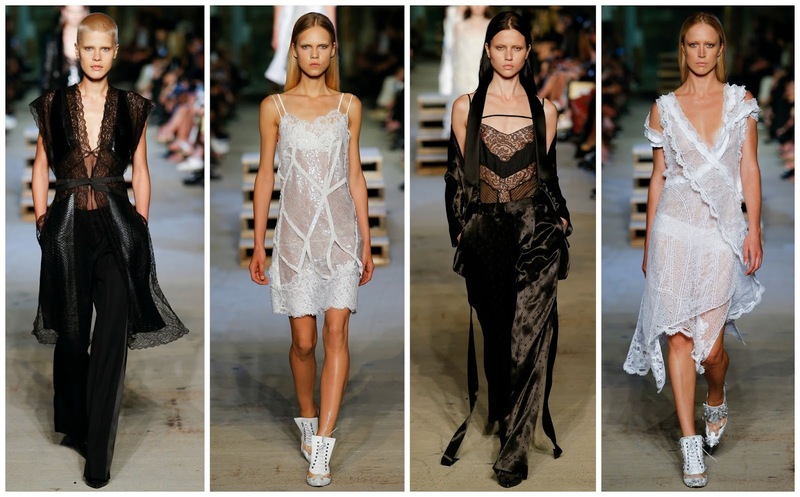 Riccardo Tisci has given us the first dilemma of fashion month. What could it be you ask? He presented a show that will be very hard for any designer, specifically during New York, to top. Held at Pier 29 River Walk, overlooking the sensational sunrise, and with a view of the Freedom Tower, the set was constructed out of debris. Corrugated iron panels were erected around the venue and guests were perched on wooden palettes. In an effort to bring people together, 400 members of the public were also present at the show, standing by the riverside, getting gorgeous views of the models. Opting not to show in Paris this season, Riccardo Tisci chose New York. The Madison Avenue flagship Givenchy store is soon to be opened. To celebrate, the Spring 2016 show headed stateside. Enlisting the help of friend and performance artist, Marina Abramovic, the show featured three performance artists, and songs from 6 different religions in order to be non-discriminatory and to unite people. In the past I’ve made my thoughts on performance art clear, but I could appreciate this—probably stemming from the fact that I actually understood it. Trees, ladders and a running faucet. Growth is what the trees and ladder signified to me. The faucet: the strength of the people. Having the show on September 11th, Tisci knows of the importance the day is to American history. "“It’s a very symbolic day for the world and for America and for New York especially, and so the message is about love.” The significance of the view of the Freedom Tower becomes clearer as you read the show notes. Installed on the front row were Nicki Minaj, Julia Roberts, Debbie Harry, Ciara, Amanda Seyfried, Hailee Steinfeld, Courtney Love, and the 55-minutes fashionably late Kanye and Kim Kardashian West. All of Tisci’s gang were present, amongst a slew of editors, and industry insiders. "Sometimes I go very dark with my design but this - I wouldn’t say it’s romantic, but it’s very serene.” Serene it was. Mariacarla Boscono emerged first in a lacy ivory camisole and palazzo pants. More lacy camisole pieces were presented in virginal white and sinister black, evoking the different aspects of religion—sin and purity—something Tisci often draws on for his collections. Black and white, ivory and cream. They were the only four colours used in the collection. The appearance of menswear wasn’t unpredictable. Male models took to the runway in sharply tailored jackets and trousers, in black and/or white. The simplicity of the colour palette allowed for the details in all the outfits to be appreciated more. One of the most exciting aspects of the collection was the remix of past couture looks. Joan Smalls were an all-black reworking of the purple Spring 2010 Couture gown. She trod carefully on the palette steps, and glided down the rest of the runway. Julia Nobis wore a reimagining of a brown, feathered gown from the Fall 2010 collection. The Fall 2011, Spring 2012 couture collections were also given modern-day reworks allowing for an impactful couture effect in RTW. The alligator gown from Spring 2012 Couture was given a new lease of life in a subtle cream colour. I was in love. The accessories further displayed Tisci’s obsession with America. We’ve seen him perfect it in the past: basketballs at couture, sportswear, BMXs on the streets of New York, stars and stripes. This season it was all in the shoes. Lace-up high heels resembled football boots. They proved difficult to walk in for two models, who took a tumble in them but gracefully got back up. Cultural amalgamation. Unity. Those are some of the words I’ve been throwing around following the show. It was a high-calibre spectacle, with the world’s most famous people front row; Tisci’s decampment to New York will go down in history.